NAC takes part in the ArcheryGB Classification Scheme which enables Archers to be awarded badges signifying their current shooting standard. Generally speaking to qualify for a particular badge an archer needs to obtain appropriate scores in three rounds of the sport which must be at recognized club shoots or tournaments. The rounds need not be all the same, but must be shot in the same season. They do not however have to be shot consecutively. For outdoor rounds, the classifications are 3rd Class, 2nd Class, 1st Class, Bowman, Master Bowman and Grand Master Bowman with suitable awards for Juniors. 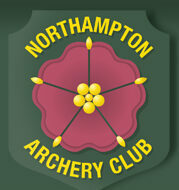 However only AGB can award the top two levels of Grand Master and Master Bowman (both at senior and junior levels). A Master Bowman will be in the top 4% of competitive archers in the country, whilst a Grand Master Bowman will be in the top 1%. AGB uses extensive tables along with a set of rules to indicate the scores required for each class of award, but to simplify things it is suggested that archers use the ExpertArcher website. This has a very simple-to-use tool that will tell an archer his/her classification for a given score in a specified round whether they be junior, senior, gent or lady. If a member therefore scores as a Class 2 in three rounds then he/she can be awarded that badge (subject to AGB shooting rules and evidence being supplied). The Club does not charge for these badges. For indoor rounds the classifications run from H through to A at the highest, but at this moment in time NAC does not present badges for indoor rounds. We do, however, award Portsmouth Round Badges, more about these can be found here. If you wish to be awarded/recognized for your classification you will need to complete an application form which once completed and put together with the necessary scoresheets should be handed to the Club Records Officer.